The sensation of smell is also referred to as olfaction. The sensory cells of olfaction are chemoreceptor neurones with a direct connection to the brain. The organ responsible for smell is the olfactory organ (‘nose’), also responsible for olfaction is the vomeronasal organ. Odour molecules, which stimulate the olfactory cells, can be either present in gases or dissolved in vapour droplets. Molecules present in gas are detected by the main olfactory organ, whilst those dissolved in liquid are detected by the vomeronasal organ. An external pair of ‘nares’ (nostrils) which act as the entrance to the organ. An internal pair of ‘nares’ located just before the nasopharynx. A richly vascularised anterior nasal mucosa, involved in heat exchange. 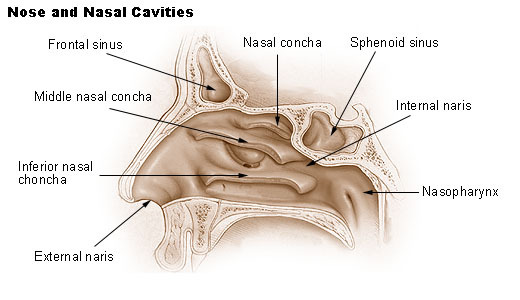 Turbinate bones, which refer to any of the spongy bones of the nasal passages. The turbinates divide the nasal airway into air passages, responsible for forcing inhaled air to flow in a steady, regular pattern around the largest possible surface of cilia and climate controlling tissue. The sensory cells of the olfactory organ, the olfactory cells which are ciliated chemoreceptors. Located ventrally to the nose, this small organ is able to detect dissolved odours (e.g. pheromones) this makes it important for signalling related to sexual behaviour. The vomeronasal organ is present in many animals including humans and although functionality in animals has been shown there is still debate over whether such functionality is exhibited in humans. Similarly to the olfaction organ, the vomeronasal organ contains receptors whose neurons possess axons which travel from the vomeronasal organ to the brain. The difference is that the neurons from the olfactory organ travel to the olfactory bulb of the brain whilst vomeronasal neurones travel to the accessory olfactory bulb. The pathway of transduction begins in the epithelial lining of the olfaction organ. Chemoreceptor neurones project from the epithelium into the mucosal layer of the organ. The projections are ciliated which increases the surface area of the receptors. Lining the plasma membrane of the cilia are smaller receptors, these receptors are responsible for detecting individual odour molecules or odourants. The odour receptors are odorant specific, so different odours bind to different receptors. There are a few thousand, different odour receptors. The odour receptors are G-protein coupled, so when an odour receptor binds its specific odourant the G-protein is activated and a secondary messenger cascade begins. In the majority of these secondary messenger systems (a relay system where the activation of a receptor causes many changes in the cell, eventually leading to the desired outcome), the enzyme adenylyl cyclase is eventually activated. This enzyme converts ATP to cAMP. The production of cAMP opens Na+/Ca2+ permeable ion channels in the plasma membrane. The influx of Na+/Ca2+ ions causes the chemoreceptor to depolarise. This causes the chemoreceptor to generate action potentials which are sent directly to the olfactory bulb of the brain. The unmyelinated axons of the chemoreceptors bundle together in small groups, they then travel through the olfactory foramina, (Small holes in the cribriform plate [part of the skull which makes up the roof of the nasal cavity]) to the olfactory bulb. These axons synapse with mitral cells in the olfactory bulb. From here the bundled axons from the mitral cells travel directly to the olfactory (piriform) cortex without first heading to the thalamus. Here odours are processed; typically one smell is made from many different odourants. The different odourants are detected individually and eventually pieced back together to form the perceived, one smell.